Part of my problem with the book stems from the fact that the ARC I received was almost unreadable--I've seriously seen pirated e-books that have better formatting. Even with this, I would have been able to continue reading if a single one of the characters was at all likable, which unfortunately was not the case. Elliot was alright, but he's the type of curmudgeonly character that I want to take to the back and shoot. Compared to the rest of his family, however, Elliot was a boon. His mother would fit in with the Real Housewives women and his younger brother was a total teenage stereotype. Then, there are the characters we don't meet, but are told about: one of his sisters ran off with the wife of the local minister and his other sister is involved with Alice's ex. Nice people, he's surrounded by there. My biggest problem is that both Alice and Elliot are too stupid to live. You're probably wondering how I know this, stopping so early in the story, but there are times when you can just tell. Case in point, they both decided to get on the decrepit boat on which they'd booked passage. I don't care how expensive the tickets were, but if the Titanic post-sinking is in better condition then the vessel I am supposed to be getting on, I would run in the opposite direction. 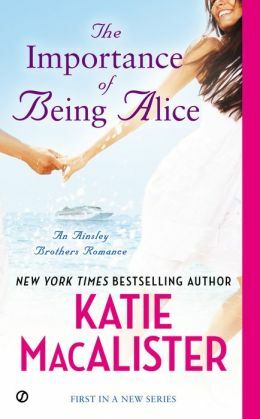 The Importance of Being Alice is available for pre-order from Amazon, BN, and Kobo.